With all the moving services you need, Meathead Movers has the most trusted Chatsworth movers to get you safely into your new home. Our clean-cut student athlete movers are dedicated to fulfilling all your moving needs honestly and efficiently. If you’re moving to Carson for a new job or to enjoy the area’s scenic views and outdoor opportunities, you’ll want to check out what the Chatsworth movers from Meathead Movers have to offer. There are many reasons to move to Chatsworth, CA, but the serene beauty of the district might be the best one. Nestled in the northwest portion of the San Fernando Valley, Chatsworth has ample parks with plentiful green space and some impressive views. With just over 40,000 residents, it has a small town feel, making it an appealing place to live. Once inhabited by various Native American tribes, claimed by Spanish explorers, and transferred to Mexican authorities, the area has a rich history that is still clearly evident in the area’s historic parks and museums. Today, the city is renowned for its beautiful and expansive parks. There are numerous open space parks, such as Chatsworth Park South and Santa Susana Pass State Historic Park. These parks feature various geological distinctions, and many are equipped with barbecue areas and children’s equipment. The city is also known for its reservoir, which was mostly emptied after the earthquake in 1971. Today the reservoir is frequented for its scenic nature, and the surrounding area has sweeping views of the Simi Hills. If you are considering a move to Chatsworth, we are here to help! Meathead Movers is the top moving company in California for long-distance, commercial, and local moves. Unlike other Chatsworth movers, we offer fixed pricing plans for long distance moves and a 100% satisfaction guarantee. All our Chatsworth movers are hard-working, clean-cut student-athletes who are trying to make a few bucks when they’re not attending classes. Our movers will also show you our trademark Meathead hustle. When our movers aren’t packing or loading boxes into the truck, they’ll jog to where they need to be next. We are available for any moving related job. We can complete both local and long distance moves. We also have dry, secure storage facilities available. Meathead Movers is the perfect choice for both residential and commercial moves, and as a bonus, we provide a distinguished move concierge service. We also offer our Princess Packers who are available to help with any packing needs, providing prompt, careful service. In all, Meathead Movers is dedicated to supporting clients at all stages of the moving process. 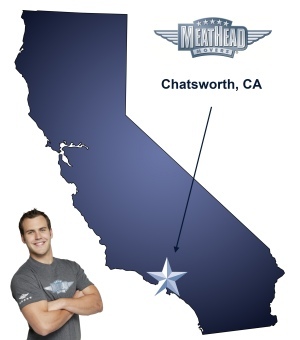 When it comes to Chatsworth movers, there are no options that compare to Meathead Movers. Therefore, for your next move, please consider Meathead Movers. Call us today for a free no-obligation moving quote. Moving to Chatsworth? Here are some helpful resources. “The fact that you employ college athletes as a way for them to earn money and good work ethics for their future career. They were courteous. Friendly and professional. It was 105 degrees when they finished our move. The fact that you employ college athletes as a way for them to earn money and good work ethics for their future career. They were courteous. Friendly and professional. It was 105 degrees when they finished our move. We would definitely recommend Meathead Movers. I’m disabled and can’t find alot of stuff that was packed!!! there were two highly expensive items broken, one we unwrapped days after the move. It was a Llardro tennis player with a broken arm. This piece is irreplaceable and broke my dad's heart it was broken. The other piece was a large, delicate porcelain dog that sits on the floor. I am not sure what the value is but know that it is over $500. You offered my parents $200 off their bill. I do not see where that was deducted. Again, when we unpacked my dad's computer, we had to search everywhere for the cords and attachments. These things should be boxed and labeled or at least taped to the unit. I also felt you were very expensive. Very professional and capable movers. Their charges were reasonable, the customer service outstanding, and their availability convenient. great communication from day one, excellent staff who were both efficient and patient, move was done quickly with no problems, and price was very acceptable.